A new study published today in the Journal of Applied Ecology reports that the number of ecosystem hotspots in Massachusetts has increased over the past decade, with more and more popping up in metro Boston. All land is not created equal. Massachusetts forests, for example, do triple duty in ecosystem benefits by filtering public drinking water, providing habitat for threatened species, and storing carbon to combat climate change. Ecologists and conservation groups single out the hardest-working ecosystems — called “hotspots” — for their exceptional conservation value. A new study published today in the Journal of Applied Ecology reports that the number of ecosystem hotspots in Massachusetts has increased over the past decade, with more and more hotspots popping up in metro Boston. But more hotspots may not be a good thing, contend the authors of the study. 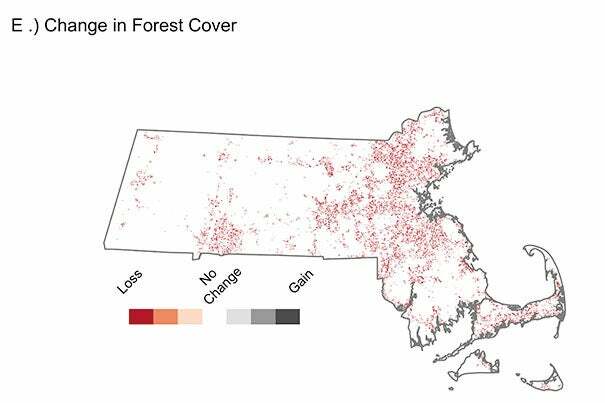 Using satellite maps, the research team tracked changes in land cover — such as forest clearing for agriculture or development — across Massachusetts from 2001 to 2011. In each 30-meter square on the map grid (about the size of two basketball courts) they applied computer models to assess which benefits each ecosystem could provide, and how those benefits changed over time. The research team found that some benefits, like wildlife habitat for ground species, declined state-wide over the study period. But benefits like carbon sequestration and outdoor recreation increased, because intact forests are growing rapidly, and more land is being conserved and made available for outdoor recreation such as hiking and hunting. For some benefits, the scale of the analysis made a big difference, says Blumstein. When analyzed at a local scale, an area of forest in the Quabbin Reservoir may appear to be less of a hotspot than a local park. But when analyzed at a regional scale, the continuous forest area around the Quabbin Reservoir provides clean drinking water for millions of Massachusetts’ residents. The scientists say they hope the research will encourage collaboration in the conservation community. “The sustained delivery of benefits from nature requires an approach that considers conservation at multiple scales,” says Blumstein. To learn more about Massachusetts “hot spots,” visit the Harvard Forest website.